Here's a look at the best and worst commercials from the 2019 Super Bowl, with views from advertising industry leaders in the U.S. and Canada. This year in the ad game, there were hits, misses and surprises. The surprises likely provided more drama than the game itself. "I was absolutely floored by the Bud Light Game of Thrones combo ad," said Andrew Simon, the chief creative officer of Edelman Canada. "That is going to remembered for a long time to come." 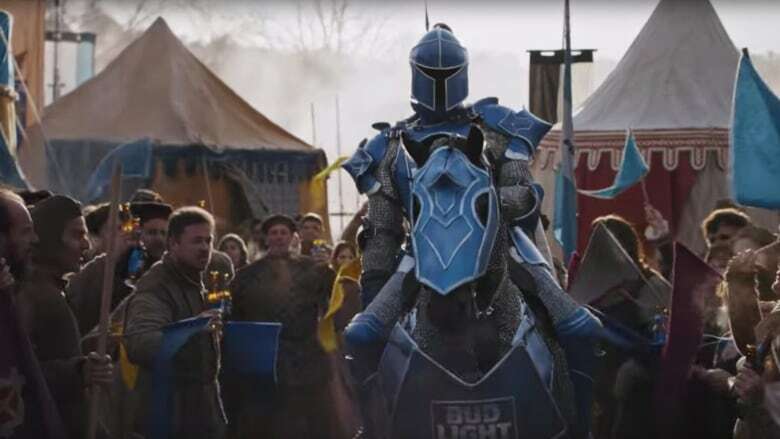 The spot started out as though it would be another fun instalment of the Bud Light "Dilly Dilly" series, ads set in bucolic, medieval times ruled by a benevolent brewer king. Then — spoiler alert — the heroic Bud Knight was killed in a jousting match by a sinister looking rival. Next, a fire-breathing dragon torched the Bud Light village. Wait. What?! Cue the title promoting the last season of HBO's hit Game of Thrones. "It was a great one-two punch for Bud Light," said Simon. "If you can get two big entities like HBO and Anheuser-Busch together, it is always fantastic when something like that can be pulled off." A couple commercial breaks later, another surprise: just when viewers thought they were coming back to the game with a live stadium shot, an 'off air' message led into a promotional spot for the CBS series Twilight Zone, hosted by Jordan Peele. That twist was made possible because CBS was broadcasting the game, saving them from paying the going rate for Super Bowl ad time. According to Kantar Media, a 30-second commercial in this year's game fetched $ 5.2 million US. While the Bud Light/Game of Thrones ad was a winner for some, there were other standout spots. The "NFL 100" promo for the league's upcoming 100th anniversary was packed with excitement the game was missing. "It just kept building and building and building," said Christina Yu, the creative director of Rethink in Toronto. She also felt the spots for Pepsi (with Cardi B, Lil Jon and Steve Carrell) and Doritos (with Chance the Rapper and the Backstreet Boys) hit the big game, big spend mark. "Your usual Super Bowl ads involve creating awareness with big celebrities doing outlandish things to be memorable," says Yu. That's why the ad for Google Translate called "100 Billion Words" struck her as especially powerful. For her, the Google spot "was an atypical Super Bowl ad" in being relatable to real people. Another 'atypical' ad scoring high marks was Microsoft's "We all Win" commercial. Jane Goldman, an independent creative director and veteran of ad the industry based in Boston says it was powerful. "This was a real case of showing, not telling," said Goldman. "It really showcases how Microsoft is using technology to try to make people's lives better." Continuing a recent trend, there was more advertising aimed at women. The new Captain Marvel featuring Brie Larson as the hero had a spot, as did the Amazon action seriesHanna. Toyota focused on female football player Antoinette Harris. Bumble, a dating app built on the concept that women message potential matches first, ran its first Super Bowl ad. The app (which also has friend and business networking functions) featured tennis star Serena Williams in a spot encouraging women to "make the first move" in all areas of their lives. Yu says the ad was outstanding. "Don't wait to be given power is a really poignant message for women to hear, and Serena Williams, who has overcome adversity in her life, was a great choice." Proctor and Gamble's Olay commercial starring Sarah Michelle Gellar impressed Goldman. "It was a really different direction for Olay to take skin care, and it showcased product benefits in a fun way." It was Olay's first ever Super Bowl ad and according to parent company Proctor and Gamble, the first time a major beauty brand advertised during the Big Game in a decade. While research shows about half of NFL fans and viewers of the Super Bowl are women, recent analysis suggests only about a quarter of ads feature women in a prominent way. Olay's brand director Stephanie Robertson says: "we know our consumer is watching and we want to make sure she knows we see her." Every year, a panel of business students at the Kellogg School of Management at Northwestern University do a Super Bowl ad review. Huddled around tables in an atrium of the Evanston, Ill. school, about 60 students score the game ads based on six criteria. The grading system goes back to a concept started in 1999 and now each spot gets a letter grade ranging from A to F.
Professor Tim Calkins says the biggest disappointment of the year for the panel was the Avocados from Mexico spot. "It was confusing and usually their ads are so good. They tried to be creative and quirky but they got a D."
Also getting a D from the school was Mint Mobile. "All you can remember from that ad is chunky milk and that chunky milk is wrong." But the biggest flop by far for Calkins and his students was the Burger King ad, which took the only F in the review. Called "Eat Like Andy" it featured archival footage of Andy Warhol eating one of the chain's Whopper burgers. "There's no benefit given and a large number of people won't get who 'Andy' is or understand," he explained. Yu saw it differently. "This ad will have a lot of talk value. It's amazing the clients were brave enough to go for the concept." For Andrew Simon, Stella Artois was a miss. "There were some clever moments, but it's not believable that the fictional characters of Carrie Bradshaw and The Dude would ever give up their signature drinks for a beer. C'mon."